Aging in (Dis)Place is a collaborative student project that examines the effects of urban revitalization projects - like the ongoing initiative in the Lawrence Heights community in Toronto, Canada - on low-income seniors. It begins an intensive problem-framing exercise, followed by a comprehensive suite of solutions. The following slides summarize our problem-framing research. Aging in place is a topic that has gained considerable momentum around the world in recent years. Governments are realizing that current health care systems are not equipped to deal with the increased demand that will soon be placed upon them by the aging baby boomer generation. Governments serve to benefit from aging-in-place policies by reducing expenses related to nursing care for elders (and, potentially, expenses related to deteriorating psychological well-being that can result from institutionalization). Elders, too, see the benefit. They consistently list staying in their homes as a primary priority to their aging process - to maintain an independent lifestyle for as long as possible (Mynatt, E., et.al., 2000, p.65). The Government of Ontario launched their official Aging in Place policy in 2007, and have allotted $1.1BN to initiatives in this realm. 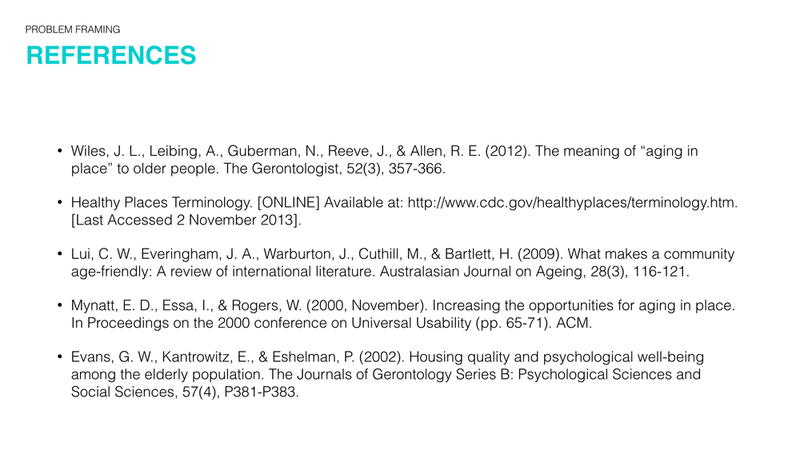 The focus of aging in place policy and research is often centred around the physical “home”, but for elders, the idea of “place” includes their broader community (Wiles et. al., 2011, p.364). Attachment to place is not age specific, but maintaining it holds special significance for elders. A long-term emotional attachment to place is an important contributor to “feelings of security, belonging, and expression of self” (Evans, et. al., 2002, p.381). It also serves an important role in the life review process, as memories are often tied to specific places: “For those who have remained in place for a significant length of time, place provides a backdrop from which to reify past selves and enable life review.” (Smith, E., 2009, p.185). The Babushkas of Chernobyl is a story - albeit an extreme one - about the powerful pull of “home”. The women who remain near the Chernobyl nuclear disaster site despite significant risks of radiation (and the abandonment of the land by nearly all residents) have made a clear choice about what is important to them. For the babushkas, their connection to home is so essential to their sense of identity that leaving would be tantamount to abandoning part of themselves. An age-friendly community is “not just a space with a range of services but also… a place that facilitates and honors the participation and contributions of older people.” (Lui, C., et. al, 2009, p. 118). Participation in community life has been proven in numerous studies to benefit elders in many ways. In fact, the 2008/2009 Canadian Community Health Survey on Healthy Aging showed that “the greater number of frequent social activities, the higher the odds of positive self-perceived health, and the lower the odds of loneliness and life dissatisfaction.” (Gilmour, 2012, p.3). 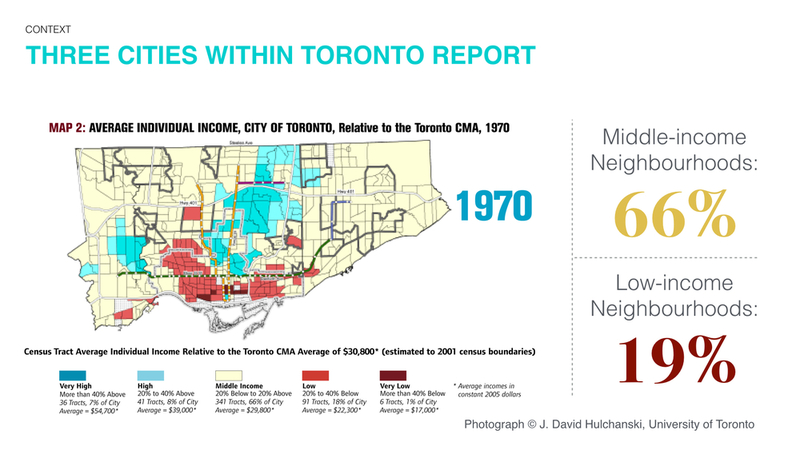 According to the Three Cities Within Toronto report, poverty has moved from the centre to the edges of the metropolitan area: city-wide trends of widening income gaps, flat-lining real incomes, precarious employment and poverty have played out spatially to create three very different groups of neighbourhoods. Former suburban environments designed for mobile middle class families began to be abandoned alongside the creation of social housing blocks in the 1950s, leaving low-income residents with nowhere else to live but the city periphery. The revitalization focus area consists of 1208 rent-geared-to-income housing units (detached houses, townhouses and low-rise apartments, including 127 units for seniors). Residents stay in the community an average of eight years, and the average household annual income is approximately $15,000. The majority of tenants are of West Indian and African descent, speaking a number of languages including English, Somali, Oromo, and Spanish. More households in the Study Area (32.2%) are classified as lower income than the City average (22.6%). Lawrence Heights is in many ways typical of a "City 3" in Toronto: There are relatively high numbers of elderly and youth populations, and a high proportion of low-income and immigrant populations, but Lawrence Heights skews much younger. Some unique features: Neighbourhood is mostly white, with significant but dispersed communities of colour; there is a significant number of seniors living alone, most are considered non-immigrant/white. Lawrence Heights residents are proud of their community and the people who live there. There was a strong sentiment of compassion, belonging, hopefulness and determination rooted in family-life relationships between neighbours and a sense of place. Each of these planning processes offered a number of opportunities to receive input and direction from residents, community agencies, land owners and others. Toronto Community Housing focused its consultation on its Lawrence Heights and Neptune Drive tenants, but will also engage the larger community. The TDSB was concerned primarily with students and their families. 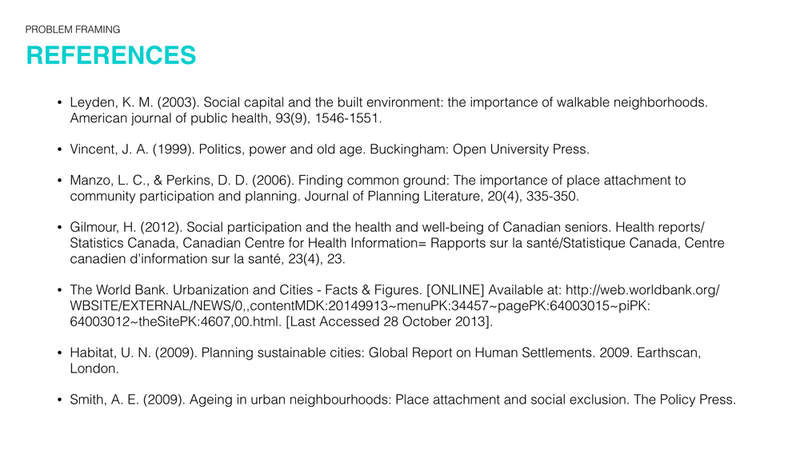 City of Toronto consultations included these groups and all other interested stakeholders from across the study area. In total, there were approximately 30 consultations with community members. Developers Context & Metropia have agreed to a community economic development plan placing $3.5 million towards resident focused employment opportunities and $500,000 towards education and job training fund for current residents – during Phase One for development stage. The plan proposes a demolition of all 1,208 units in the neighbourhood, as well as Lawrence Square, replaced by modern affordable units, market housing and retail/commercial streets. 7,500 Units are to be constructed. That’s 6,292 new units. The current population of the Lawrence Heights community is 3,500, projected to increase to 16,000 once the revitalization is completed in 15-20 years. The City of Toronto's Comprehensive Planning Framework for the Lawrence Heights Revitalization project does not emphasize meeting Seniors’ needs. In June 2010, Toronto Community Housing conducted community forums as part of a revitalization study for the Lawrence Heights neighbourhood. This involved doing a group SWOT analysis for the proposed Revitalization project, from which they released some guidelines to shape future decision making. In May 2011, a local community service agency called Unison Health and Community Services released a Community Scan Report intended to inform program planning. The research included focus groups with eight different groups of residents, including seniors. Some interesting findings emerged from both studies, with notable differences in scope. The TCHC study focused mostly on the physical infrastructure needs of the community, whereas the need for social infrastructure and supports were what came from the Unison Community Scan report -- reflecting the different missions of the two organizations. The stakeholder matrix lists primary stakeholders in the revitalization process, with associated needs. Our next step was to rank each need by relative priority. The full matrix, along with an Interest/Influence map, can be found here. Revitalization Plan is announced: As federal and provincial funding for social housing is cut in Canada, groups like the Toronto Community Housing Association (TCHC) have been forced to look for novel ways to finance their support services for residents in need. They have chosen to do so by partnering with private sector developers to re-imagine social housing blocks as "mixed income" communities. The planning process for redeveloping Lawrence Heights began in 2007, with developers and condo demand driving private sector interest in the densification project. Current residents were reportedly cautiously optimistic about the plan. Consultation with Residents: TCHC hires community "animators" - local Lawrence Heights residents - whose role was to work with TCHC and the City to refine and develop a vision for the community. With increased community animation, active residents became more on-side, but others (particularly isolated seniors) remained unable to engage. There was only 1 workshop hosted for seniors, despite their high demographic representation in the neighbourhood. Residents of social housing are to be given 120 days notice to evacuate their homes and be temporarily relocated during construction. Residents prepare for the difficult transition process with a mixture of hope and disempowerment, while community agencies ready their support. New construction - to be completed by 2016/17 - is geared toward affluent young professionals. ‘Space in between’ and construction process: The staged process of redevelopment is expected to span over twenty years - a great deal of time for elderly residents to cope with the disruption. Some may not live to see the results of the revitalization. Construction stages are contingent upon attracting new condo purchasers and businesses. Move-in and integration: Residents will return to Lawrence Heights in overlapping stages along with new condo dwellers, with some arriving/returning while others are leaving. Priority is assumed to be given to market housing residents and businesses. At the time of this report no plan has been made for how to successfully integrate the two communities. Unless this occurs, we anticipate that older residents may feel alienated and alien within the new environment, and could develop an "us vs. them" mentality. Youth and young families, on the other hand, feel hopeful about what the revitalization could mean in terms of new opportunities and a chance to redefine their public image. 50% of the world’s population currently live in cities. By 2050, it will be 70% (UN Habitat). By 2030, it is expected that 85% of the world's population will be in developing countries, with 15% in LDCs (World Bank). Any initiatives developed for Lawrence Heights should be evaluated based on how they might translate to similar redevelopment projects around the world. 2. Uncovering and preserving the search for meaning and purpose: Focus groups with Lawrence Heights residents have revealed a desire to be active in their community, and literature reveals that autonomy to define one's own purpose and meaning in life is an important and overlooked aspect of well-being. Our solution could enable elders to find the legacy they want to leave in their community. 4. Scalability & Adaptability: Many areas in the world as well as across Canada are experiencing conditions where neighbourhoods are uprooted and displaced. In some situations, the displacement is driven by revitalization projects with the expectations for population to move back into the newly revitalized neighbourhood; in other situations the population is driven out completely. Our solution must be adaptable to fit these multiple scenarios and conditions. Furthermore, our solution will be scalable to fit large and small communities around the world, fitting multiple languages and accessibility. 5. Financial Viability: As part of our solution, we will consider a funding model. This may include government funding, crowdsourcing, member funding (co-operative model), or for-profit model. At present there is no clear singular point of intervention, perhaps suggesting need for a holistic, coordinated, long-term response within the community. Our solution should address this.